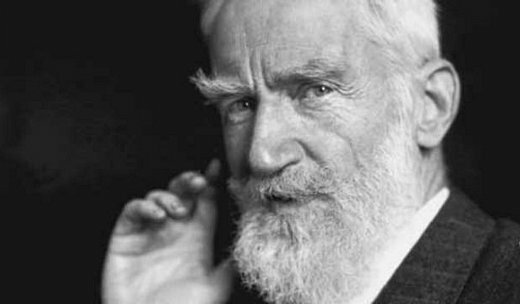 In 1905, George Bernard Shaw received a piece of fan mail from an aspiring playwright initially known only as "Miss Charming" that would ultimately result in the following unique letter. Miss Charming was in fact a 24-year-old lady named Erica Cotterill, and Shaw was so intrigued by her approach that he replied with advice, thus beginning a flirtatious relationship that would see him writing often and occasionally turning down her increasingly frequent advances. Erica, however, was determined to get her man, going so far as to move house in order to be closer to the object of her desires; then, one day, 7 years after first making contacting with Shaw, she turned up at his home only for his wife, Charlotte, to open the door. Charlotte demanded that her husband cut all ties. He attempted to do so, but in an intriguing way: he drafted the following letter to his admirer, as if written by his wife. I think I had better write to you to explain exactly why I intentionally shewed you that I strongly disapproved of your presence in my house, and that I did not—and do not—intend that your visit should be repeated. You might easily think that I was merely annoyed by your coming at an inconsiderate & unusual hour—as indeed I was—or that I disliked you. That was not it at all. I should object to your coming at tea time just as much as I do not particularly dislike you. On the contrary, it is because you are in some ways rather fine and sensitive, so that it is very difficult to be unkind to you, that I am determined to put a stop at once and for ever to any personal intimacy between us. The matter is a very simple one. You have made a declaration of your feelings to my husband; and you have followed that up by coming to live near us with the avowed object of gratifying those feelings by seeing as much as possible of him. If you were an older and more experienced woman I should characterize that in terms which would make any further acquaintance between us impossible. As you are young and entirely taken by your own feelings, I can only tell you that when a woman makes such a declaration to a married man, or a man to a married woman, there is an end of all honourable question of their meeting one another again—intentionally at least. You do not understand this, perhaps; but you will later on, when you are married and know what loyalty men owe one another in that very delicate and difficult relation. The present case is a specially difficult and dangerous one, for my husband is not a common man; if you become at all intimate with him he would become a necessity of life to you; and then the inevitable parting would cost you more suffering that it can now. I could not trust him to keep you at a distance: he is quite friendly and sympathetic with everybody, from dogs and cats to dukes and duchesses, and none of them can imagine that his universal friendliness is not a special regard for them. He has already allowed you to become far more attached to him than he should; and I do not intend to let you drift any further into an impossible situation. If I must end by saying that this letter does not admit of any argument or reply, and that I do not mean it to lead to any correspondence between us, do not conclude that I am writing you in an unfriendly spirit. It would be no use to discuss the matter now; and later on, when you are married and as old as I am, it will not be necessary. Meanwhile believe that my decision is quite inevitable and irrevocable.